Lifetime gets there first this weekend with “Love You to Death,” a movie clearly “inspired” by the case, which draws upon the public record, changes the names but hews closely to the basic story. That will be followed in March by “The Act,” a limited series that will play on Hulu, which is adapted from a lengthy Buzzfeed article by Michelle Dean. “It’s Gypsy’s story, and it should be done the right way,” Kristy Blanchard, Gypsy Rose’s stepmother, told CNN. The sordid nature of the actual events — which culminated in Dee Dee’s murder, after victimizing her daughter by convincing Gypsy and the world that the girl was ill, a form of abuse known as Munchhausen by proxy — is captured reasonably well in Lifetime’s version, which isn’t as compelling as the documentary but still proves watchable and unsettling. Marcia Gay Harden stars as the mother, named Camile, who goes to great lengths to keep Esme (Emily Skeggs) dependent upon her. That includes subjecting her to unnecessary treatments, lying to medical personnel and binding her daughter to make her look younger and perpetuate the ruse. 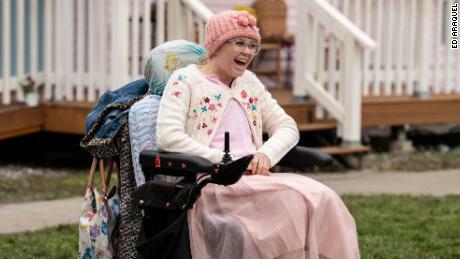 The Lifetime movie goes relatively light on the wider extent of Dee Dee’s fraud, which, as “Mommy Dead and Dearest” detailed, earned the pair trips to Disney World and charitable support from neighbors and national organizations devoted to assisting sick kids. Hulu will stretch out the story over eight episodes, with Patricia Arquette (fresh off her standout turn in Showtime’s “Escape at Dannemora”) and Joey King in the central roles. The service had no comment about the Lifetime film. Filmmaker Erin Lee Carr, who directed “Mommy Dead and Dearest,” isn’t involved with either project, but isn’t surprised by the interest. “I just think it is such a wild story I immediately knew it was going to be dramatized,” she said. Gypsy Blanchard pleaded guilty to second-degree murder in her mother’s death. Her boyfriend, Nicholas Godejohn, was found guilty of first-degree murder in November. Kristy Blanchard said the family’s goal isn’t to profit from the story but to clear up inaccuracies and misrepresentations regarding the facts. “Let the truth be known,” she said. The Blanchard saga certainly feels tailor-made for Lifetime. At its core, there was the toxic mother-daughter relationship, and a secret romance. But there’s also an underlying lesson about media, and its manipulation, in the way Dee Dee intuitively understood how to exploit the situation — and people’s sympathy — for attention and financial gain. The message conveyed by the existence of these dueling projects is equally illuminating, saying a lot about the current age of true-crime TV — namely, when it comes to tales that capture the public’s imagination, anything worth doing is usually worth overdoing. “Love You to Death” premieres Jan. 26 at 8 p.m. on Lifetime.